Cabalist; born 1410; died 1440. He was the author of "Segullat Melakim" (Royal Devices), a treatise containing information on practical Cabala and on magic and natural science, which he collected on his travels. This treatise he wrote for his son Lamech, whom he warned against magic, which he denounced as the "black art." The work is divided into four parts, of which only the first part and the table of contents to the other three parts are preserved, in a manuscript originally belonging to David Oppenheimer's library, now in Oxford. 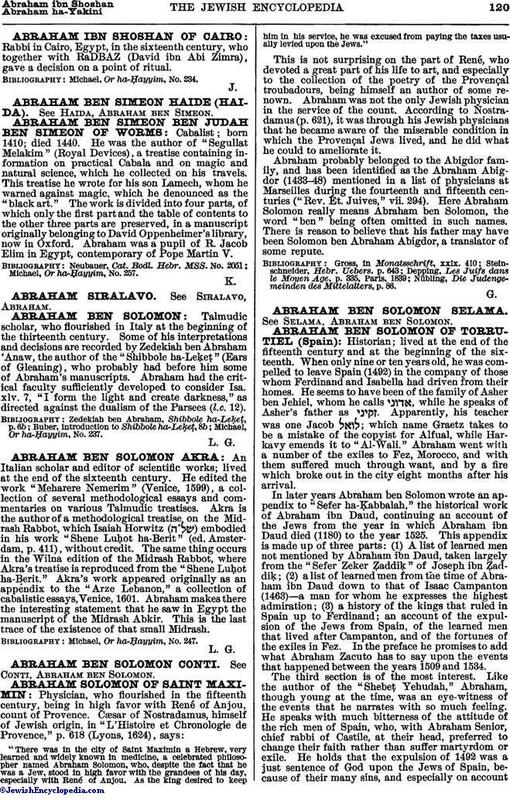 Abraham was a pupil of R. Jacob Elim in Egypt, contemporary of Pope Martin V.
Michael, Or ha-Ḥayyim, No. 257.